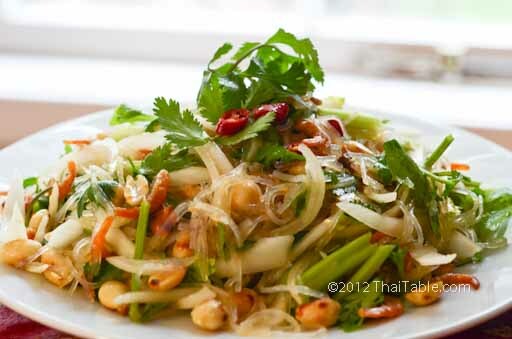 Yum Woon Sen or bean thread noodles salad is a popular dish in both inside and outside Thailand. The combination of ingredients and seasonings make this dish delicious. I love how the bland noodles absorb the hot spicy sour dressing while the peanuts add the nutty, crunchiness to the salad. When you hit the dried shrimp, it packs with saltiness and flavor. Chinese celery and cilantro bring in freshness. I keep going back and forth, a little bit of this and and a little bit of that. 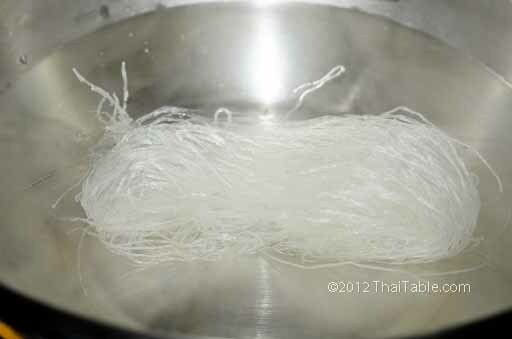 Many Thais view bean thread noodles as a diet food. I don't think it works for me. Yum Woon Sen is so good that I keep eating it. That's totally ineffective! I recommend this dish for pot luck or party because it stays delicious at room temperature for a few hours. You can prepare all the ingredients ahead of time and mix the dressing at the last minute. You can adjust Yum Woon Sen to have more or less ingredients. Many people like to add ground pork and tomatoes to yum woon sen. You can dress it up by adding cooked large shrimp like many restaurants do, too. I like mine simple with just dried shrimp for protein. 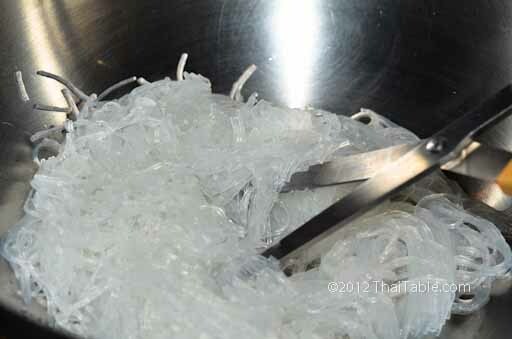 Clear noodles are also known as glass noodles, cellophane noodles, silver noodles and bean thread noodles. The noodles are white when uncooked and dried. When they are cooked/soaked in hot water, they turn clear. Regular celery is a good substitute for Chinese celery. Slice the them thin and use the leaves, too. The home-grown celery tastes comparable to Chinese celery. Soak the sliced onion in the salad dressing to tone down the heat in onion. If you like the salad mild, cut the chili peppers big, easier to pick out. I tried using raw garlic, it doesn't give the complex flavor like fried garlic. Here is the link on how to make easy fried garlic. Red onion is a great substitute for brown onion and it doesn't impact the flavor negatively. It adds another color to the dish, purple. However, I don't use it because it's not an ingredient you'd find/use in Thailand. The clear noodles I use come in a pink mesh bag with 8 2-ounce bundles inside. You only need one bundle (2oz). Put the noodles in a heat resistant bowl. Pour boiling hot water over the noodles and let soak for 6 minutes. Move the noodles around to make sure that all the strands are submerged. You can start prepping other ingredients. At this point, I set the timer for 6 minutes. Strain the noodles. When the water stop dripping (2 minutes), pour the noodles into a large mixing bowl and cut them with scissors randomly to make the strands easier to serve and eat. 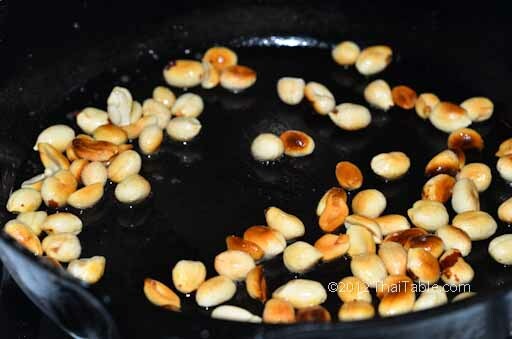 If you are using raw peanuts, fry peanuts in 1 teaspoon of oil over low to medium low heat. You can also toast peanuts in a pan without oil, too. Either way takes about 5-7 minutes for the peanuts to turn light brown and cooked. Remove peanuts and set aside. 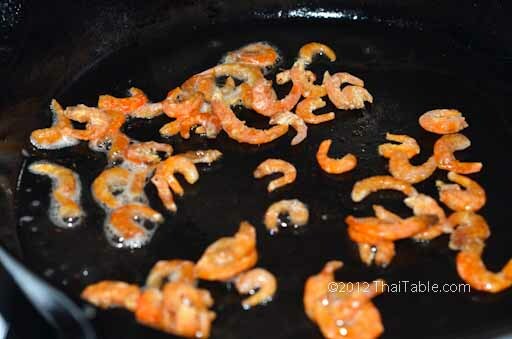 Fry the dried shrimp over medium heat until crispy and brown, about a minute, depending on the size of your shrimp. When the shrimp turns whitish, remove from heat and set aside. Cut the Chinese celery into 1 ½ inch pieces. Slice onion, top to bottom to get crescent pieces. Chop cilantro and chili peppers. For one lime, I get about 3 tablespoons of juice. 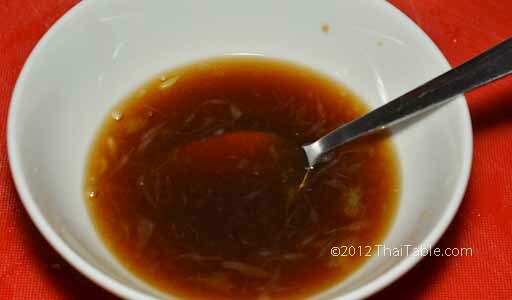 For every tablespoon of fish sauce, I use about 5 tablespoons of lime juice. You want the sauce to be more sour than salty. You'll need to taste your dried shrimp to see how salty they are. Dried shrimp is another source for salt, so the tossed salad will be a little bit saltier than your dressing. The role of sugar here is to round the flavors. The dressing should not even have a hint of sweetness. Mix the fish sauce, lime juice and sugar together well. This makes approximately 6 tablespoons of dressing. Add a tablespoon of fried garlic to the noodles and mix them. Fried garlic gives the noodles flavor. Add 5 tablespoons of the salad dressing to the noodles and mix well. 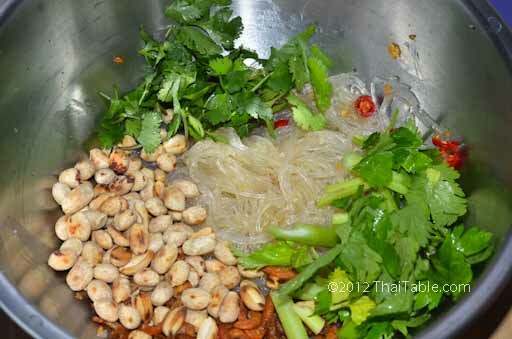 Add the peanuts, dried shrimp, onion, Chinese celery, chili peppers and cilantro to the noodles. Toss well and taste. You may need more dressing, depending on water content of the noodles and the concentrations of your seasonings. Some noodles can absorb more water and keep on expanding. That is not a desirable characteristic of good noodles. Anyway, there is 1 more tablespoon of dressing to play with. The noodles should be soft (not mushy) and full of flavors (spicy and sour). If you use freshly toasted peanuts, the nutty aroma is incredible when you crunch on them. The Chinese celery is refreshing addition to the salad. Yum Woon Sen tastes really good right after you mix all the ingredients. However, it's a good party or pre-prepared dish but less intense flavors. Serve as an appetizer or main course.